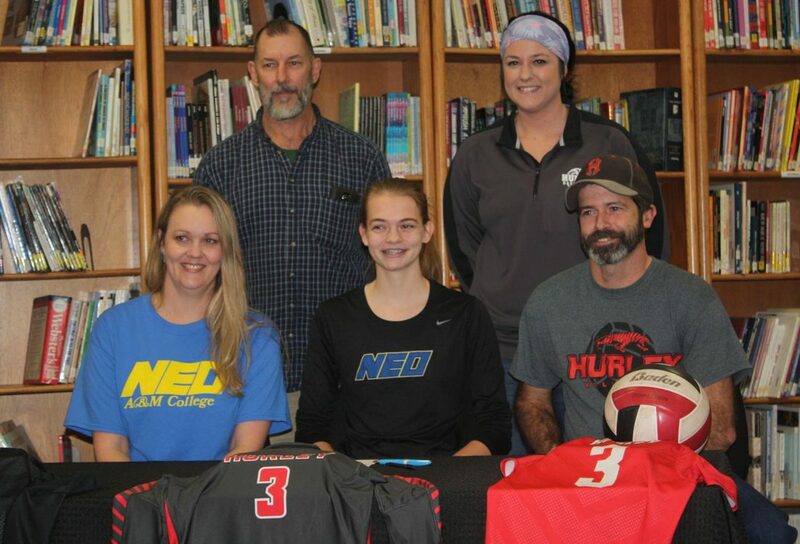 Paige Simpson, of Hurley, signed a letter of intent to continue her volleyball career at North Eastern Oklahoma A & M College on Monday, December 7. She is pictured above in center front. Also in the front row are her mother and father, Bobbi and Don Simpson. In the back row, from left to right, are Brent Moody, Assistant volleyball coach, and Laken Walden, Hurley volleyball coach. Simpson received 1st Team All-District and 1st Team All- Conference. Paige led the Hurley Tigers in blocks and kills, having 316 Kills for the season and 37 Blocks. Paige Simpson has been wearing the red and black for Hurley leading her team the past few years and now she’s taking it to the next level. Monday afternoon Paige Simpson signed her letter of intent to play volleyball at Northeastern Oklahoma A&M College in Miami, Oklahoma. “I’m very proud of this girl, she has dedicated a lot of time and effort to the game of volleyball and today it’s paying off for her. I know many nights she’s been in the gym to hit and work on perfecting her game. I know she means business when it comes to volleyball, and it’s paying off for all of her time and hard work. Congratulations to her parents, Bobbi and Don, because of their effort Paige has gotten to this point now. As a coach I am glad for the opportunity to have a part in this, and I look forward to future success on and off the court and in the classroom with Paige. She’s worked hard, and she deserves this. NEO holds a special place in my heart and I am glad to be sending Paige there. I can’t wait to visit my old stomping grounds and watch her play for the Coach Ivy and the Lady Norse,” says Hurley volleyball coach Laken Walden. Hurley Head Coach Laken Walden graduated from Crane in 2010 and went on to play volleyball for the Lady Norse at Northeastern Oklahoma A&M, then returned in 2013 as the Assistant Coach under Head Coach Eric Iverson.